We are specializing in making beautiful custom cables for your needs. We strive to make the ordering process as easy as possible. - If you want to have a cable that matches with your special keycaps sets, please go to Ninja Coordination and pick one from our growing list. Our Ninjas have worked really hard to ensure the cables that you order will complement with your keycaps set in the most beautiful way possible. - If you feel like you want more control of how you cable look like besides the option choices given, please go to the Custom Cables section. This section will let you design your custom cables from the ground up and let you specify every single elements of your cable. If you want a paracord color that we don't have, or need our help to match a cable with something that you have, please choose "Custom Color" and specify your request in the Special Instructions box at the bottom of the page. A link to a picture of what you want us to match it with will be greatly appreciated. As we are building our stock, we will order that color combination for you if it is available from our supplier. Please allow extra processing time when you choose this option. Depending on the volume and the complexity of your order, it can take from 3 to 4 weeks for us to finish processing your cables. Please keep in mind that our cables are hand-made one by one in the US, it might take longer than expected occasionally. Our volumes also fluctuate depending on the occasions or seasons of the year. "Payment Accepted":We have accepted your payment, and your order is in the queue. An order will have this status for about 1-2 weeks. "Assembling" or "Sleeving": We're actively working on your order. It will take another 1-2 weeks for your whole order to be completed from this point. Once an order gets out of the Payment Accepted stage, it is not possible to cancel your order without incurring cancellation fees. If your order has not passed the 4 weeks period since your order time, please kindly refrain from asking for updates as it will slow us down and make it slower for us to finish with your orders. We are a small staff with a big passion, always wanting to make the best cables for those who are in pursuit of aesthetics excellence. Please let us know in advance if you need your cable for an occasion such as birthdays, anniversaries, etc. We can, and do make exceptions on the order of the queue, but we try to be fair and not to do that too often. How do I order coiled cables? We have made some changes throughout our website. Now the ordering process for coils should be pretty self-explanatory. We're sorry if you happened to order coiled cables from us before and got confused now when you come back to us. We do believe the new system is better. - With the current structure of our website, coils length will be calculated by our system into this total length number. So if you order a 5ft cable with coils, the length from one USB connector to the other one with the coils fully-retracted is 5ft. This is completely different than what we have before. - A 3ft of total cable is usually sufficient if your keyboard/device is next to your computer on the desk. Order longer cable length if in doubt. - For coils length, the most common option is 6", which will give you coils that are about as long as the distance from the F1 key to the F8 key on a standard keyboard. From the F1 key to the Print Screen key is a little over 10". These are rough estimates, a ruler will be helpful if you want more precise measurement. Our coils and cable length are +/- 1" from what you order (*usually we like to be precise about coils though, so 98% of the time, you'll get the length of coils that you order). - USB 2.0 standards only allow max cable length of a little over 15ft. So if you order a straight 15ft cable, that's fine. If you order coils, you will not get a 15ft cable with coils. The reasons for that is it takes about 1ft of cable twirling around to make only 1.25" of coils. So, as you see, the more coils you order, the shorter your finished cable will get, because we just have 15ft of cable to play with per USB standards. If you order coils, please don't order cable that are longer than what is suggested in the Coiling Options box (we're very serious about staying in specs). Please note that what is suggested is a good estimate of the actual number. Ordering shorter than the max length suggested is always ok. If you need to have longer cable that is +/- 6" from the max length number, please contact us. We do have a handy Max Cable Length Calculator here that might be useful to you. - Any other special requests: half-foot length, distance from connector to coils starting point, dual colors cables, gift messages, etc. Do you test the cables before shipping it out? - #1: after connectors are soldered with the wire. - #2: after high-temp glue is applied to the connectors. - #3: after our industrial-graded heat-shrink is applied to the connectors. - #4: our final test of the cable before it is packaged and shipped out. What is MDPC or MDPC-X? MDPC is a high-quality plastic sleeves made in Germany. These sleeves have a tight weaving pattern and they have much higher quality than Techflex PET sleeves. 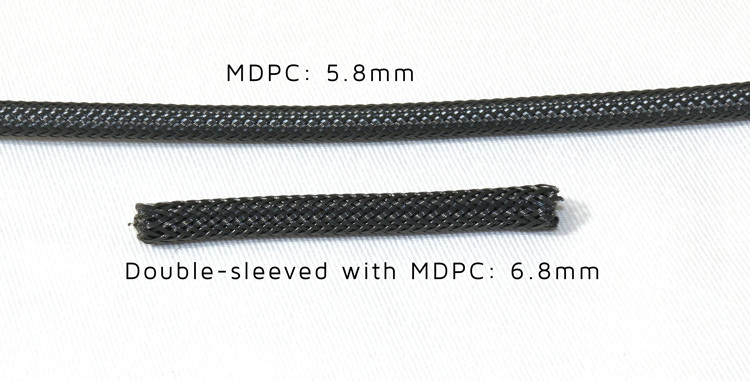 What is the difference between MDPC and MDPC sleeves with paracord base? Paracord and MDPC double-sleeved cables are thicker and are more durable than just paracord or paracord double-sleeved with Techflex PET. Currently we are shipping to selected countries. If your country is not in our current shipping destinations, please let us know and we will try our best to accommodate you. No refunds or exchange on cables. Because of the nature of our products offering, refunds or exchange of other products are on a case by case basic only. Excluding errors on our part and depending on how far along we are with processing your order, cancellation might or might not be possible. Up to 50% waste fees will apply if we have already started working on your cables. You are also responsible for all transaction fees resulting from the cancellation. Please check your account for order status and tracking number when we ship your orders. There is also a Guest Tracking page if you haven't created an account with us. Winnja's Cables except for Lightning cables carry a 6-month limited warranty should your cable fails with no cosmetic damage. Lightning cables will have a 3-month warranty. Please arrange with Winnja first for a Warranty Claim before shipping the cable. Winnja will repair or replace defective product or connectors upon receipt of Buyer's returned shipment. Buyer pays return shipping and Winnja will pay for shipping of repaired item to Buyer. Winnja will not be responsible for any duty or taxes upon delivery. No refunds or exchange on cables.